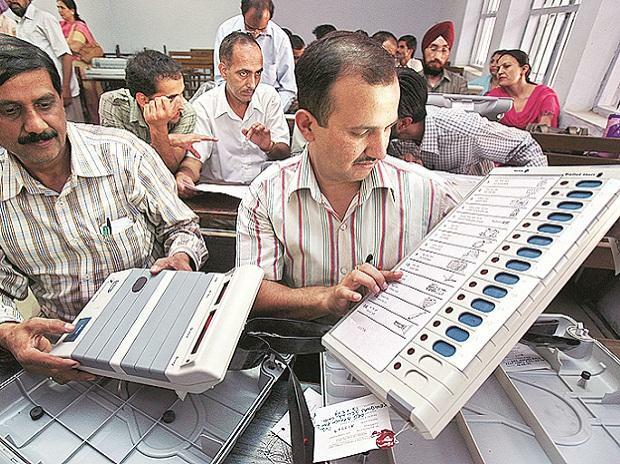 The Law Commission has said over Rs 45 billion (Rs 4,500 crore) will be needed to buy new EVMs and paper trail machines for "imminent" simultaneous elections to the Lok Sabha and state assemblies. In its draft report on simultaneous polls issued last week, the law panel quoted the Election Commission as saying that around 10,60,000 polling stations will be set up for the 2019 general elections. "It (EC) further informed that as of now there is a shortfall of about 1.29 million ballot units, 940,000 control units and about 1.23 million VVPATs (voter verifiable paper audit trail machines or paper trail machines), if simultaneous elections are to be held," the report read. "Thus, the EC has informed that an expenditure of about Rs 45.55 billion (Rs 4,555 crore) will be incurred on procurement of EVMs for an imminent simultaneous election," the draft report read. Keeping in mind the average shelf life of 15 years of an EVM, the Law Commission said that at the prevailing rates, Rs 17.51 billion (Rs 1751.17 crore) for conduct of the second simultaneous elections in 2024 and Rs 20.17 billion (Rs 2017.93 crore) for the third simultaneous elections in 2029 will be required for procuring EVMs. "Thereafter, Rs 139.81 billion (Rs 13,981.58 crore) will be required for procuring new EVMs for the proposed simultaneous elections in 2034," it said.